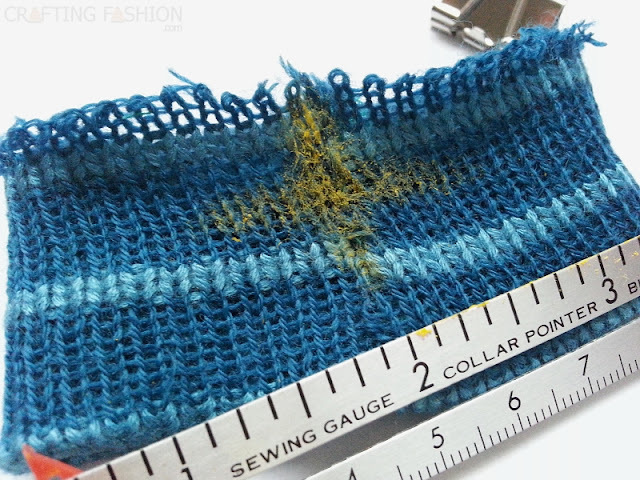 It never occurred to me before I had my own serger that this would ever be an issue. I think it's because the last time I used a serger (someone else's) I had no need to serge in a circle as one does for necklines or cuffs. I only realized that this was a task requiring special consideration when I first watched the DVD that came with my new serger. Then I understood. First you slip the edge of the fabric under the presser foot. The fabric is fed to the knife. The knife trims the fabric just before the needles and loopers do their work. If you're serging in a circle there's no edge or starting place to slip the fabric in squarely. What I ended up doing was something different. 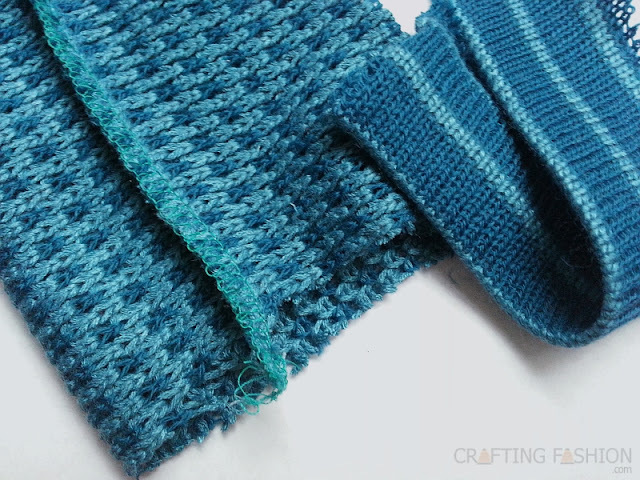 It works great with sweater knit fabric. 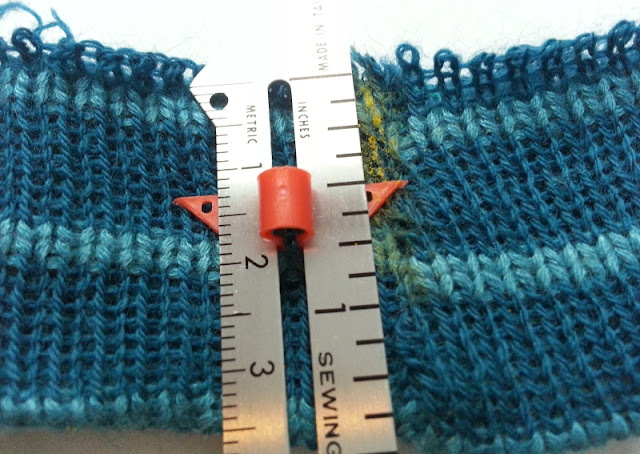 As demonstrated here, it really could be part of Attaching the Rib Bands to the Garment, but the method can be used in a number a situations. 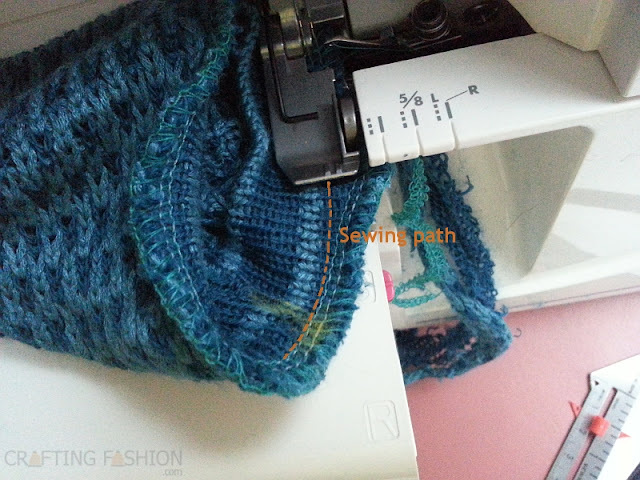 You can use this method when setting in sleeves or attaching cowl to sweater, waistband to skirt or just finishing an edge (that happens to be circular) with your serger. 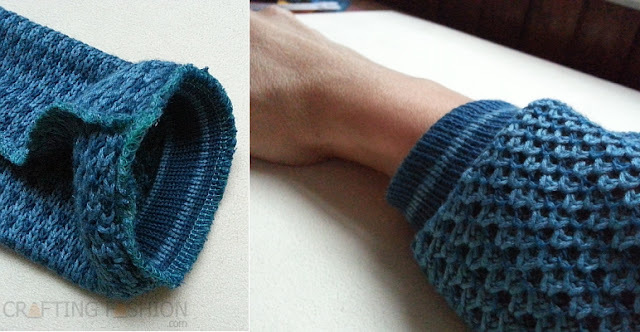 I'll be demonstrating by attaching a knitted cuff to a sleeve. If you're attaching one piece to another, start this tutorial after you've sewn your side seams, shoulder seams or whatever you need to sew so that you're working with 2 tubes, attaching circle to circle. On the left is the sleeve. One the right is the cuff, ready to be stitched into a tube. Step 1. On the wrong side, using tailor's chalk, draw about a one-inch vertical line over one seam. This will be your starting point and ending point. Do this on the piece that will be facing you as you serge. Ruler is indicating my half-inch seam allowance. Step 2. 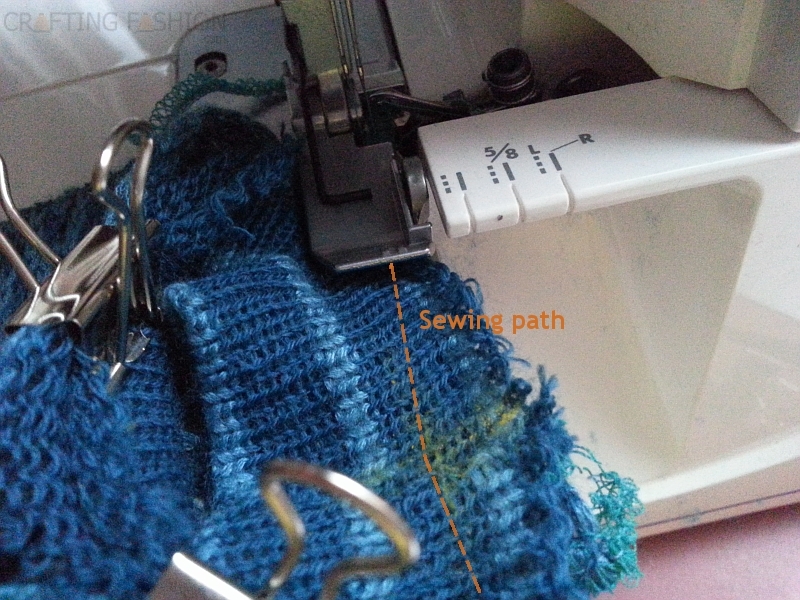 Draw a line at the seam allowance perpendicular to the starting line you drew in Step 1. It will look like the pic below. The "+" sign marks the place to start stitching with the proper seam allowance. Now you have the starting line and finish line marked. (It's the same seam line.) The horizontal line (in the picture above) marks the sewing line, which is the path of your left needle. Step 3. After pinning or clipping your pieces together (refer to Attaching a Rib Band, if applicable), you're ready to start the stitching. Starting at the edge at about 2 inches behind the "starting line", take a running start. That is, begin stitching while gradually cutting into the seam allowance so that by the time your needles have reached the "starting line", your fabric is correctly positioned at the left needle and you'll be serging with the correct seam allowance. Step 4. Continue serging around the circle. At some point you will "lap" your first stitches. Keep stitching at the correct seam allowance cutting away those first stitches. Step 5. Serge a little bit beyond the finish line to lock in the stitches. And it's done! That's it! And no scary pre-cutting of seam allowances. Funny. :) Glad to be of service. Wow, what a great step by step demonstration & the fabric looks FABU!!!! Thank you so much! Can't wait to try this.